Jeff Peachey – Page 166 – Peachey is an independent book conservator. He also invents, makes, and sells tools for bookbinding and conservation. When playing Blackjack, the simplest forms of card counting usually involves keeping a plus or minus running total. One system, which assigns Aces, face cards and 10’s a minus one, and all others a plus one, can give the player an idea of how many aces, 10’s and face cards are left in the deck, or decks. If the plus count gets fairly high, you should increase the size of your bets, if it is negative, decrease the size. Card counting is legal, but Casinos will ask you to leave if they suspect you are counting. In many respects this system is similar to card counting– a running count is assigned to various common paper treatments, such as surface cleaning, washing, bleaching, tape removal, etc…. These treatments subtract points from the total. The extent of work and evidence of work subtract points as well. Using “benificial materials (1)”, written and photo documentation will add points. The score starts at 100 and generally gets lower. The higher the total score the better restored (more valuable?) your artifact is. Should I hit on an eighteen? One troubling aspect of this system is that bonus points are awarded for repairs that are so visually indistinguishable that a “device [is] needed” to detect them! Repairs that are visually apparent at 12″ or less are given a neutral score of “0”. Another troubling aspect of this is that it enters a gray area in the AIC Code of Ethics, especially Commentary 2- Disclosure. Of course, it is up to individual conservators if they join AIC (2) and if they choose to abide by the Code of Ethics and Guidelines for Practice or not. I have chosen to do so in writing. One advantage of adhering to the Code and Guidelines is that it offers a conservator protection against lawsuits, since the treatment follows the current accepted practice by the professional organization that represents conservators. The commentary recommends disclosure the formula of a patented item, but patenting a system of classification? It seems to limit the use of this new methodology (3), except by the assignees, and does not further the professionalism in the field by demystifying conservation procedures. Instead, does this dumb down the field by simply giving the client a quantifiable number, like a movie or restaurant review? Maybe we should just give thumbs-up or thumbs-down when examining an artifact. Does the attempt to quantify our examination make it seem less subjective and more scientific? 1. I wonder how this would be determined. 2. There are many advantages to joining AIC and a speciality group, such as the Book and Paper Group (BPG) or Conservators in Private Practice (CIPP). First, they hopefully lead to an exchange of information intended to raise the level of treatments, exchange information and increase professionalism within our field. 3. Although from the patent description, this system seems intended more for collectors rather than conservators. I seriously doubt that it will become widespread, but the point is if it were to become a standard means of describing an object, anyone other than the assignees would have to pay or get permission to use the system. About three years ago, I got tired of never being able to find the basic tools that I used the most. I kept them in a couple of cans at my workbench, and they ended up all over the place by the end of the day. 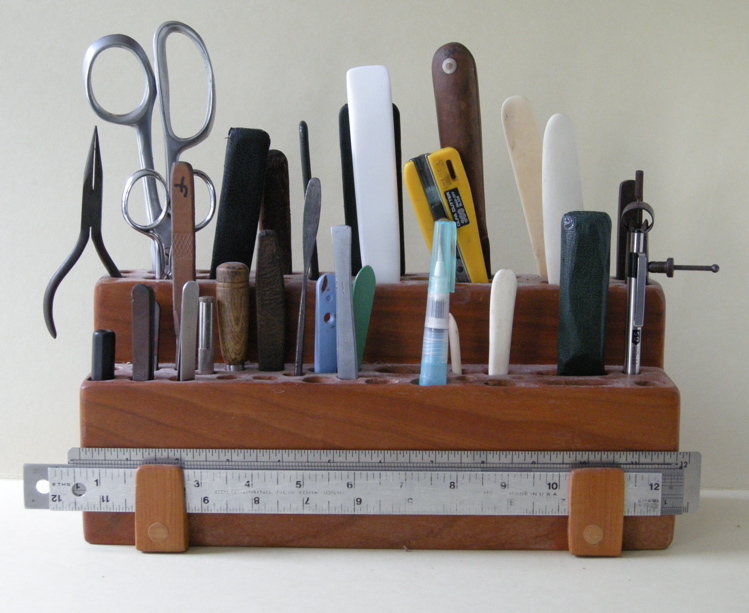 I decided to first analyze which tools I actually used the most, which turned out to be a tiny fraction of the tools I had, and devise some kind of storage so that I could easily reach and immediately put back when I was finished. Although it took a bit of time to do this, I estimate it saves about 5-10 hours a year in time spent looking for tools, which is significant. I constructed this holder out of two pieces of eight quarter cherry. I also made a travel box for working on-site that has a similar system built in. In case anyone is interested, below is a list of the tools that I use to accomplish about 90% of my normal tasks, and a few comments. Not pictured are brushes and larger rulers. 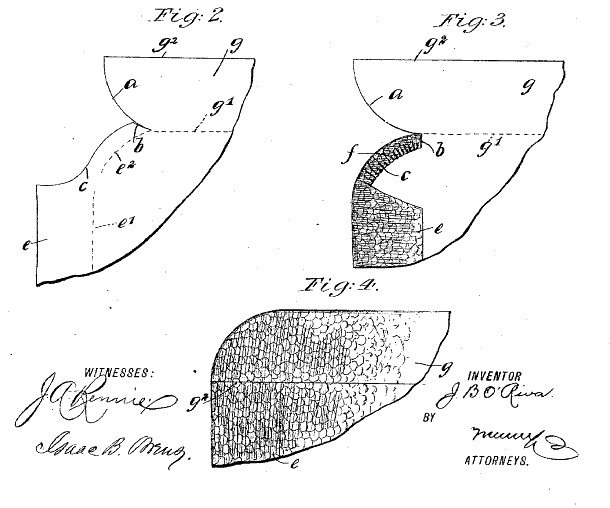 I found this interesting corner, US Patent # 562,649, issued to John B. O’Riva in 1896. It is long out of protection, so anyone can make it. 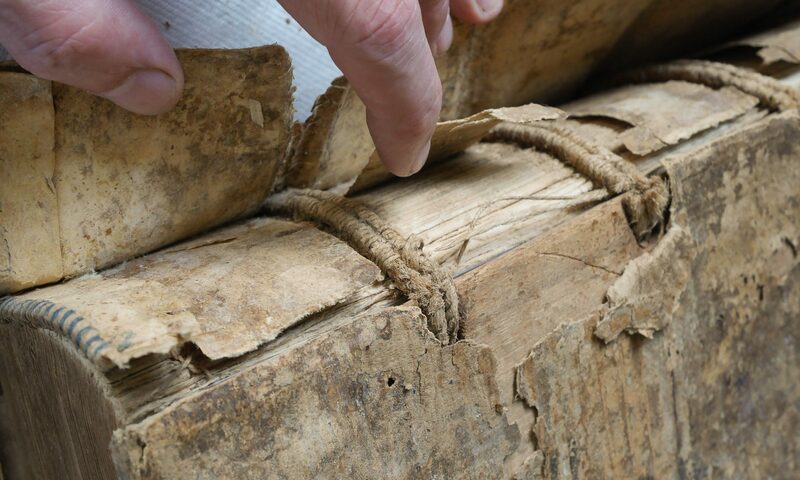 O’Riva states, “The object of this invention is to provide a binding for books which will be strong and durable without necessitating the destruction of the grain in the leather used for the binding.” It seems intended to be used for bibles with flexible covers. I appreciate O’Rivas sensitivity to preserving the beauty of the grain, which makes me think he came out of an arts and crafts background, rather than from the trade, who favored a very highly polished leather surface which made tooling easier. This invention created a very smooth looking corner while preserving the natural grain and covered the puckering of the leather when it was pleated over the rounded edge. Possibly the leather could be left a bit thicker than a standard rounded corner. The overlapping layers of flexible board would also add some strength at this critical place. It would be very interesting to find an example of this corner, I’ve never noticed one. Flexible board bibles like these tended to get carried back and forth to church every Sunday, and even if they were not read a lot, 19th C. ones are not as common as the ubiquitous large, illustrated Victorian Bible, for example. It seems it would be very difficult to enforce this kind of patent, especially if another binder had seen one of these and tried to copy it. But perhaps the patent was to protect the inventors idea against more large scale publishing house infringement. In this drawing, the grain pattern of the leather makes it seem like some kind of reptile skin, or other exotic such as shagreen. These types of leather are difficult to turn in neatly, let alone mold around a rounded corner. Given the 1500 year history of the codex structure, to come up with something new, for something as basic as a corner, is genius. Except for hand held bibles, rounded corners are rather out of fashion these days, as are large squares, but if someone makes one of these, please send me a photo. I imagine this could also work with cloth, although I haven’t tried it. The cut edge of cloth along the curve could be vulnerable to wear, fraying and delamination. It might work better with paper. Hats off to O’Riva!